Our products will keep you warm, concealed, and protected when the temperatures start to drop and the snow starts to fall. Great for late season hunting, the Predator Parka features our patented ArcticShield heat retention technology, with a Warmth Factor 3, making this our warmest suit for those cold, snowy days. The brushed tricot outer shell makes this parka soft, quiet, and bur-free. 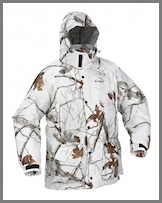 Large, bellowed cargo pockets on both the jacket holds all your necessary gear. Match up the suit to the ArcticShield beanies and gloves, also in Realtree AP Snow pattern, for a full system to keep you completely concealed.